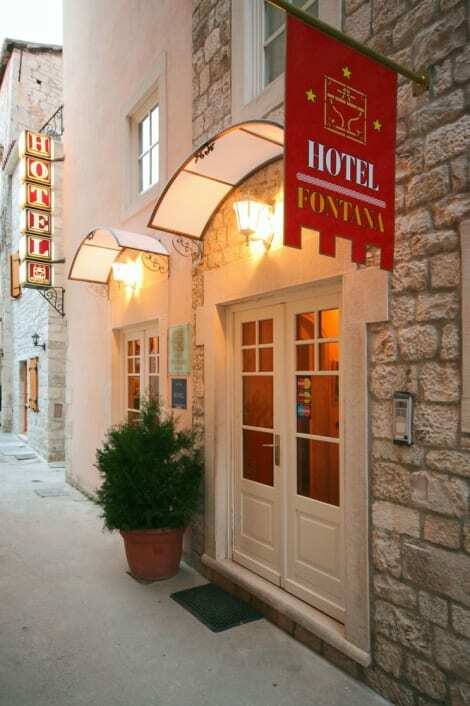 This charming ancient stone house is located right at the waterfront opposite the Old Town of Trogir. Tastefully combining old and new, all rooms feature air-conditioning and flat-screen satellite TVs. Panoramic views of Trogir, exposed stone walls and hand-made oakwood beds provide for an exclusive atmosphere in each of the Villa Tudor's rooms. Free Wi-fi is available in all of them. Within a 2-minute walk from the Villa Tudor you can reach Trogir's historic centre, which is connected to the island of Ciovo by a 150 metre-long stone bridge. Breakfast is served in the rustic-style restaurant featuring an inviting street-side terrace. Free private parking is possible on site. Enjoy recreation amenities such as an outdoor pool or take in the view from a garden. This hotel also features complimentary wireless Internet access and a reception hall. The apartments are situated in the western part of the island of Ciovo, away from the city's stress and noise. Ciovo is a small island, connected with a bridge (100 m) to the UNESCO-protected Old Town of Trogir. Okrug is famous for its mild Mediterranean climate, rich subtropical and Mediterranean vegetation, the archipelago of small picturesque islands and innumerable small hidden bays and beaches. Rivera Okrug is one of the most attractive tourist destinations in Croatia. The sea and the pebble beach are approximately 200 m away from the complex, which is some 500 m from the town centre and bus station. The historic city of Split is about 30 km from the complex, and Krka National Park is some 45 km away. Split Airport is approximately 10 km away from the establishment. The apartment complex consists of one- and two-bedroom apartments. Both types of apartment are spacious and well equipped, bed linen and towels are provided. Among the additional activities in the vicinity, guests may choose between a diving school, different excursions and scuba diving. This smoke-free apartment was built in 2008.